provide to the LADISPE a smart system able to manage the help requests of the students. Our idea is strictly linked to our academic experiences, to be more precise to the practice lessons in the labs during which 2 or more tutors are available for helping students and answer to their questions. The way to capture the tutors' attemption is raising the hand... and prey. In fact the most frequent situation that you can find in laibs is seeing tutors running from a side to another of the laib in a limbs forest. On the otherside, it's also possible to find the situation in which very few students ask for something so the tutor perches in a strategic point of the laib doing nothing but waiting to see a hand raised. The worst consequence of this management of the lessons is that both students and tutors waiste a significant amount of time. >>able to sense when a student needs the tutor in order to prevent the tutor from doing it, not because the tutors are not able to do it, but because the environment could do it better. We don't want the environment to read in students' minds or sniff in their work. We want that when a student has to ask something he/she has just to execute a simple gesture to make the environment aware of it and then just wait for a tutor to come, continuing to work or, if the problem is too huge to continue working, doing something else, like exchange doubts with other students. We also want the tutors to answer questions and doing nothing else, except walking. Therefore we want make the environment able to sense and recognize the student gesture, track all the students that need help and, anytime a tutor is free and a student needs help, tell the tutor to go to the student. #Sensing: sense when a student needs help. We want each student to behave as usual, so we ask him/her just to raise an hand, as they do in any other situations. We immediately rejected to think about a unique device able to sense it and we propose to provide each student a device. The simplest solution is to create the device using the computer on which the student is working and a webcam. #Communication: between queue management module and tutors: tutors don't need to have access to the queue, they need, wherever they are in the laib, just to know the student to go to help. Also these requirement implies that every tutor has to be provided a device able to communicate with the environment. System able to recognize a raised hand: in the course version every student uses a computer of the laib. We've so decided that this module should be implemented as: a program running on the computer that analyzes continuously the images catured from a webcam. 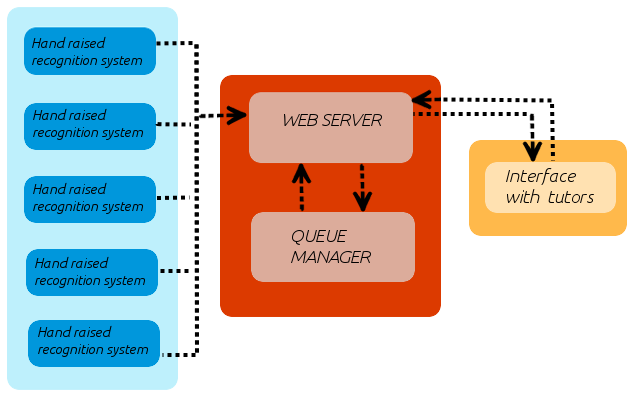 Reservations queue manager: a software that implements a queue. It has to be hosted by any kind of module that has enough computational power. The queue should be able to receive reservation communications and manage them. Devices for the tutors: the only thing that the tutors have to do is to ask for the computer to go to, so they need the smallest device able to send the request to the queue manager and show the result. We've decided that this devices would be smartwatches. We've decided for pebbles because they're supplied in the course. pebble: pebble app that we're still developing. Recognition module-Queue Manager: the software able to recognize gestures sends to the queue manager something that identifies the computer on which the student that has raised the hand is working. SOCKET: we thaught that the best way to do it is to send a string containing the computer id. We've verified that we can perform this very simple communication using a socket: the socket would be opened to send the string and then closed to avoid the presence of too many unused sockets. OTHER OPTIONS: we're considering other options. We've not implemented anything yet.